Calcutta has become home to a surprising number of hangout zones, with a bunch of new cafes springing up across the city with a variety of experiences on offer for a discerning clientele. And so, I decided to visit them one at a time, before there became too many to write home about. 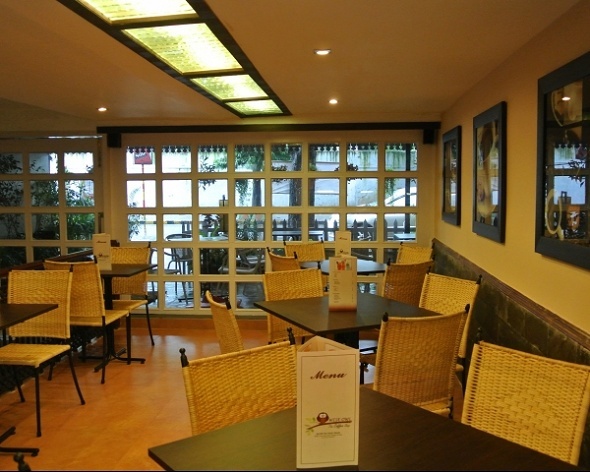 I made my first stop at Wise Owl Café on Purna Das Road. Located opposite the quintessential Azad Hind Dhaba, this café now occupies the ground level of Guest House, which I suppose, can only live up to its name. It’s designed with indoor and outdoor seating, both being extremely charming in their own way. The café gets its name from the many owls in different shapes and sizes that line its walls as you walk in – some look ferocious, while others, downright adorable. While the interiors are simple, yet cozy, I have to say that I’m particularly partial towards the alfresco dining space. There are plants everywhere, and the slanting Old-World European tile roof is extremely pretty. The atmosphere is unbelievably relaxed; people sit here for hours chatting up, running into old and new friends, sharing cigarettes and digging into the fresh, piping food making its way to the tables. For everybody who thought that the good old bangali adda would only be complete in a roadside tea stall, think again. You can’t possibly walk past Wise Owl and not feel the urge to be a part of its ambient bonhomie – this is a world of its own, that’s very Calcutta and yet, not quite. Of course, you cannot attest its complete bangali-ness unless the food commands all your attention, and I’m happy to say that it does! The menu is American-Continental, which includes an elaborate breakfast spread – pancakes, oats, bacon, eggs, sausages, tea; the works. But if you’d like to gorge on endless plates of melt-in-the-mouth fish, deliciously fresh chicken or even appetite teasers (my favourite is the bacon wrapped prawns; they’re divine), Wise Owl won’t disappoint you. So you could choose grilled fish in lemon butter sauce, chicken cacciatore or fried chicken (cooked in a pesto-ish red sauce) to feed your deprived soul. Each dish is as good as the next, and you’ll find yourself negotiating flavours that are mild, to those stronger on the palate. And do not be fooled; the portions are HUGE, and if you aren’t a hogger, don’t even imagine that you can wipe off a single dish from the main course without generous help from fellow eaters. On another occasion that I went to Wise Owl, I chose to have Maggi with lots of green chillies and mushrooms in it. It was a cool winter evening, and the steaming hot Maggi mixed with just the teeniest bit of cheese was brilliant. The only bit of complaint is the fact that service here takes time – Lots of it! If you’re starving, it may not be the best place to go to, because then the disappointment of waiting for some grub might just cloud the rest of your experience. Keep that in mind when you walk in. Because once you get past technical issues like service, and the slightly overpriced menu, the rest of your time will be spent in absolute, happy bliss.